Twentieth-century music began in 1951, the year Schoenberg died and Cage began to use chance. After WWII, the postwar avant-garde congregated at Darmstadt’s “Ferienkurse für neue Musik,” where Boulez, Nono and Stockhausen reigned supreme. Adorno delivered that summer’s composition lecture, replacing an ailing Schoenberg (it was also Maderna’s first season). The performance of Messiaen’s Mode de valeurs et d’intensités (from the 1949-50 Quatre études de rythme) influenced Stockhausen who completed Kreuzspiel later that year. Other 1951 Darmstadt premieres included Goeyvaerts’ Sonata for Two Pianos with the composer and Stockhausen at the keys, Scherchen conducting Schoenberg’s “Dance Around the Golden Calf” from Moses und Aron, and Nono’s Polifonica-Monodia-Ritmica (1950). Across the Atlantic, Babbitt had already concocted his own flavor of serialism with the 1947-48 Three Compositions for Piano and the 1948 Composition for Four Instruments; he completed Du in 1951. Carter’s String Quartet No. 1 was written in 1951 and Cage finished his Concerto for Prepared Piano and Chamber Orchestra (1950-51), Music of Changes (1951), and Imaginary Landscape No. 4 for 12 radios (1951). In addition to several conventionally notated piano works (Nature Pieces, Variations, and several Intermissions), Feldman had just created his first graphic scores with the Projections and Intersections series. Berio studied with Dallapiccola at Tanglewood, Varèse was constructing Déserts (1950-54), and Copland delivered the Norton Lectures, “Music and Imagination,” at Harvard. Menotti’s Amahl and the Night Visitors (1951) premiered Christmas Eve on NBC TV. Schoenberg died Jul. 13th in Los Angeles and Stravinsky’s The Rake’s Progress premiered in Venice (Sept. 11). Elsewhere: Ligeti started Musica Ricercata (1951-53) and Shostakovich completed the 24 Preludes and Fugues (1950-51). The Russian composer was between his Ninth (1945) and Tenth (1953), and String Quartets Nos. 4 (1949) and 5 (1952). In England, both Britten’s Billy Budd (1951) and Vaughan Williams’ The Pilgrim’s Progress (1951) received their premieres at Convent Garden, and Gerhard wrote his Piano Concerto (1951). Among 1951’s orchestral statements: Hindemith’s Symphonie “Die Harmonie der Welt,” Dutilleux’s First, Villa-Lobos’ Ninth and Henze’s Third. Martinu and Hartmann both began their Sixths. 1951 premieres included Ives’ belated Second (1901) and Hartmann’s Fifth, “Sinfonia Concertante.” Vaughan Williams was working on the music which would become Sinfonia Antarctica (1949-52). Legend has it that Sibelius had already destroyed his Eighth, even though he claimed still to be working on it. Whether or not his brief studies with Schoenberg (1935-36) were the impetus, Cage employed rigorous systems predominantly focused on rhythmic structures throughout the following decade. He tried serialism but had more interest in manipulating pitch collections and chords according to strict rules. Everything changed in 1951 when a precocious student, Christian Wolff, gave him an old book in a new English translation, the I Ching (Wolff’s father ran Pantheon, the publishing house, and often paid for lessons with advance copies). Recollecting this fateful discovery, Cage mentioned that Lou Harrison showed him the Chinese oracle back in the ’30s but that he had no use for it then. From the Concerto for Prepared Piano and Chamber Orchestra’s last movement onward, Cage consulted the I Ching for most every subsequent composition. Music of Changes is a transitional work. Upon a rigidly determined, large-scale rhythmic structure, Cage used chance to settle on density, small-scale tempos, durations, sounds, silences and dynamics. Tossing coins and navigating through charts, Cage tried to excise his experience from decision-making, an “exploration of non-intention.” Chance played a role only during the composition’s creation. The music’s fastidious notation requires a precise interpretation. Subsequent pieces would completely embrace indeterminacy, and Cage would eventually yield to chance in every aspect of composition and performance. The difficult 45-minute solo-piano work would not have come into being without David Tudor. A willing collaborator, Tudor’s technical prowess and penchant for extensive preparation enabled the work’s complexity. Further, without Tudor’s encouragement, many subsequent works including 4’33” (1952), Williams Mix (1953), Indeterminacy (1959), and Cartridge Music (1960) might never have come about. Seeking an accompanist for Cunningham’s dance troupe, Cage had once worked with the younger pianist. In 1950, Cage’s new friend Morton Feldman reintroduced them to each other. The composers’ first encounter is legendary: They met while fleeing a New York Philharmonic concert because neither could stomach Rachmaninoff after Webern. Fresh from a European trip, Cage had returned with copies of another friend’s piano sonata he wanted premiered. Feldman lent his copy to Tudor, and so on Dec. 17, 1950, Tudor gave the first American performance of Boulez’s Second Sonata. Boulez probably wouldn’t admit that he learned anything from Cage as he pursued total serialism, despite Structures Ia’s slight visual resemblance to Music of Changes and echoes in the 1958 Poésie pour pouvoir’s of Williams Mix’s raucousness, to name just two works Cage sent across the Atlantic. Once Boulez discovered that Mallarmé had used chance, he admitted it into his own Artaud-infused universe, viz. the still unfinished Third Sonata (1955-?) and 1974-75’s tautly controlled Rituel in memoriam Bruno Maderna. Ironically, Boulez told Cage about a project titled Un coup de dés (ca. 1950, incompl.). It seems clear that the older American attempted to emulate the characteristic density of the European avant-garde in Music of Changes. However, where Boulez’s Second bristles with fierce impulsiveness, Cage’s interest in complexity exhausted itself in Music of Changes’ laborious compositional process. C.F. Peters published Music of Changes in four parts (Peters 6256, 6257, 6258 and 6259). A thin I ends on page 9, its last bar dated 5-16-51; II spans 10 to 44, its end-date 8-2-51; III passes from 45 to 64 and its final bar bears 10-18-51; and IV concludes on page 86 with 12-13-51. Each book reprints the performance notes. I features the dedication “For David Tudor,” and a graphic representation of the time scale. “The notation of durations is in space,” one quarter-note per every 2 1/2 centimeters (less active measures halve the scale, one quarter-note per 1 1/4 cm). However, the available Peters edition unwisely reduces Cage’s original to 85% (presumably the original sheets were 12 1/2 x 9 1/2 in.). Instead of 10cm 4/4 measures, the two-measure systems actually span 17cm. Peters recently collected early Cage keyboard works into thick volumes. Perhaps they’ll reissue the four books in the correct size. 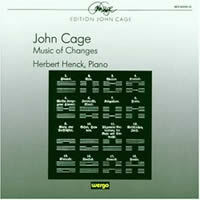 Prior to Music of Changes, Cage employed highly structured rhythms (e.g. : 1950’s String Quartet in Four Parts, the Concerto for Prepared Piano, etc.). The instructions to this four-volume opus begin: “The rhythmic structure, 3 – 5 – 6 3/4 – 6 3/4 – 5 – 3 1/8, is expressed in changing tempi (indicated by large numbers) (beats per minute).” In 4/4 this adds up to 29 5/8 measures, forming three-page sections. Cage shortens the last measure’s width, clearly marking it 5/8. The rhythmic structure determines the volumes’ durations: 3, 5 + 6 3/4, 6 3/4, and 5 + 3 1/8. Therefore, I contains three sections. II occupies 12 sections whose last breaks the steady 4/4 flow with 17/16 measures and a final measure with an added 3/32. There are seven sections in III, the concluding also ending with some 17/16 measures and the extra 3/32. IV is nine sections, 8 are the predominant 29 5/8, but the last is a four-measure lagniappe of 4/4, 27/32, 27/32 and 65/64. Each 29 5/8-measure section contains as many as eight layers. Working from meticulously prepared 8×8 charts, Cage tossed coins to determine the number of layers (“superpositions”), along with tempos, durations, sounds and dynamics. On the sound and dynamic charts, some elements were replaced after a single use. Silence accounts for half the 64 elements on each sound chart. The 32 sounding elements (single notes, chords or gestures) themselves were arrayed into two 4×4 groups so that reading any four elements across or down reveals all 12 tones (with repetitions and octave displacements). Music of Changes’ tempo changes appear at the 3 – 5 – 6 3/4 – 6 3/4 – 5 – 3 1/8 points. This causes mid-measure fluctuations after the first 6 3/4 unit. While the predominant two-measure span specifies eight proportionally notated beats, the conventionally notated tempo changes are counterintuitive. Cage also says, “[a]ccelerandos and ritards are to be associated with the rhythmic structure, rather than with the sounds that happen in it.” Does this mean that events occur closer together at fast tempos and that no single gesture should slow down or speed up? Except for III’s first section, the tempo varies continuously. Cage would eventually abandon the cumbersome tempo notation, positioning all events relative to absolute time. Contrary to standard practice, Cage insisted that pitches sound at the location of stems and not noteheads. Sustained notes’ durations are clearly specified, a plus sign (+) indicating releasing keys. Additionally, confusing fractions (1/7, 2/3, 1/5, etc.) appear over many notes and rests. In I’s measure 6, a 3/7 appears over a dotted eighth-note rest. The measure continues with a sixteenth rest, a half-note tied to a dotted-eighth with a 3/5 over it, followed by a dotted half-note dyad (which presumably carries into the next measure). Page 32 ends with three noteless measures: The first has a sixteenth rest with a 1/7 followed by a dotted-half rest, the next a 1/6 over a centered sixteenth rest, and the third a double-dotted-half, another half, and a sixteenth with a superimposed 1/7. II, III and IV appear marginally neater than I. Tudor played I in July and August 1951, and premiered all four books on Jan. 1, 1952, just 19 days after Cage inked IV’s final date (Imaginary Landscape No. 4 was composed concurrently). Cage confided to Boulez that he hurried completion of the score and that his working method was to compose and copy two pages at a time. Music of Changes’ tethered chaos requires a determined pianist. Precisely specified pages leave no room for chance in performance. Navigating the congested score, pianists must reason out the fluctuating tempos, impose a time scale over the notes and play with a digital clock. Chords do not lie well. Unevenly sized note heads cluster clumsily. Notated sustained pitches add events which aren’t actually played. Clef changes and ledger lines are counterintuitive: The left hand may momentarily switch to treble-clef ledger lines prescribing rapid hand-crossings. The fractions can mislead. Every inch has to be deciphered, possibly rewritten for clarity. Trying to put WWII behind them, many European composers hungered for a break with the past. Schoenberg and Webern became the new idols: Both were casualties of Nazism or of the war itself. Further, dodecaphony’s requirement that every pitch be treated as an equal appealed to those wishing to counterbalance ethnocentrism and, by inference, fascism. Boulez was chief among those who heeded serialism’s siren song. The young firebrand, who would become a fanatic standard bearer, created some of mid-century’s most vibrant and difficult scores. Leibowitz had taught Boulez dodecaphony’s essentials, but Messiaen provided the spark. The organist and prisoner of war apparently never discussed serialism in his classes prior to 1950, although he had been open to non-Western influences and experimented with assigning every pitch a unique duration and dynamic, as revealed in the influential piano etude Mode de valeurs et d’intensités and the Soixante-quatre durées, which concludes the 1951 seven-part Livre d’orgue, an intriguing mixture of religious observance, birdsong, Indian ragas and rhythmic puzzles. In imitation of Artaud, Boulez’s music was violently flamboyant, and the keyboard works were no exception. The 1945 solo-piano Douze Notations — an early composition still recognized possibly because the dozen provide fodder for an incomplete set of extroverted orchestrations (I–IV 1977-80, VII 1998) — marries Debussy with Schoenberg, notwithstanding the repeated chords and brazen acrobatics (each piece has 12 measures too). Serialism reigns supreme in Boulez’s Second Sonata (1948), its rhythmic twists alluding to Beethoven’s Hammerklavier. Only Nono would absorb serialism as quickly, though he gravitated towards cabalistic canonic and variation processes applied to pitch, rhythm and text. However, like other composers circulating through Darmstadt, he would soon become absorbed with other concerns. It is doubtful anyone would confuse the 1951 Music of Changes with anything by Boulez, though Cage definitely had the Second Sonata’s sonorities in his ear. 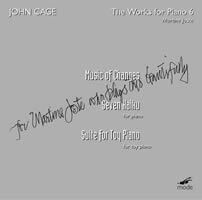 Just as Boulez’s sonata bounds along a single kinetic line without secondary voices, Cage eschews any distinction between foreground and background. Choked with activity, dense areas sound like random collisions; the silent measures are bare deserts. An attentive ear notes an absence of development. Repetitions are inconspicuous; immediately repeated notes sound rather like mistakes or involuntary reflexes. The infrequent pizzicato, muted note or piano-case slap sets this apart from Cage’s contemporaries who limited themselves to keyboard-initiated sounds. Leapfrogging past Music of Changes, Boulez’s Structures I (1951-52) breaks conclusively with the past. Perhaps realizing the performance impracticalities of Cage’s four-part monolith, Boulez specifies two pianos, though doubling resources necessarily meant more to control. Goeyvaerts and Michel Fano’s contemporaneous two-piano sonatas perhaps influenced the instrumentation. Akin to Cage’s 8×8 grids, Boulez organized Structures’ pitch, dynamic, attack, duration and rhythm with 12×12 charts. In Structures Ia, the row’s 12 pitches and attendant durations are immediately apparent, their disposition across the page bearing a visual similarity to the American’s work. Soon after, Boulez adjusted his worldview to permit controlled chance. In his next two-piano effort, Structures II (1956-61), the pianists choose between pre-composed passages. Some passages briefly revisit Notations’ quasi-juvenile whimsy. Among its two “Chapitres” and their “Textes,” “Encarts” and “Pièces,” Structures II advances with an unCagean ferocity. For a fact, violence is significantly absent from Cage’s output after 1951. Boulez’s Third Piano Sonata, begun in 1955, remains incomplete. Pianists who tackle its extant parts determine their components’ order. Stockhausen dedicated Klavierstücke V-VIII (1954-55) to Tudor. When they worked together on the pieces, the American pianist reacquainted the German composer with Music of Changes. Here and there the Klavierstücke briefly resemble Cage, but then again, the varied piano pieces alternately declare allegiance to Bartók, Webern and Boulez, reflecting Stockhausen’s quicksilver abilities at assimilation. Perhaps following Boulez’s lead, Stockhausen folded indeterminacy into Klavierstucke XI (1956), though in a manner that Cage famously dismissed. Goeyvaerts’ evolution was perhaps the most deliberate. Megadisc MDC 7845 sequences his first serial compositions. An airily recorded Sonata for Two Pianos comes across dryly, lacking Webern’s elegance. The subsequent Opus 2 for 13 Instruments is more inventive, though the premiering ensemble found it too challenging. Consequently Goeyvaerts continued his serial exploration in tape pieces: Compositie No. 4 (1952) and No. 5 (1953) focus on single pitches and their durations, impracticable for live musicians. Barraqué’s unsung Sonata (1950-52) is notoriously tricky to navigate, primarily due to inconsistent notation shrouding complex rhythms and voicing. In perhaps the period’s most traditionally minded sonata, Barraqué delineates the two-movement structure through different tempo groups, often changing from measure to measure. Unlike many of his peers, he resisted rejecting the past, though, as with Boulez, the direction he applied to his music’s progress was of the greatest significance. A rigidly organized serial composition, single pitches may repeat for emphasis or to articulate a melodic line. Feldman’s fully notated, terse and apparently non-complex solo-piano works of the period (several of 1951’s Nature Pieces and Variations, 1952’s Extensions 3, Intermission 5, etc.) reflect a Webern-influenced ear for compelling sonorities played at the relaxed pace we occasionally glimpse in those moments in Music of Changes when the composition dwindles to fewer layers. Compared to Cage’s formidable opus, the Feldman of the 1950s was a miniaturist. While the long, large-scale pieces were decades away, a taste for widely spaced ninths and sevenths is already clear. Extensions 3, Intermission 5 include literal phrase repetition which no one — not even Cage — dared employ. Pierre-Laurent Aimard plays Boulez’s Notations and joins with Florent Boffard for Structures Book II on DG 002894775385 (reissued from DG 445 833-2). There’s also col legno 31800, col legno 20509, or col legno WWE 12CD 31899 with Boulez and Yvonne Loriod’s 1961 Donaueschinger world premiere. Structures I is hard to find but Wergo WER 6011 offers the Kontarsky brothers at both books. Of Boulez Seconds, I’m partial to Pollini’s forceful reading on DG 447431, reissued as DG 471359. Complete sets by Claude Helffer (Astrée E 7716, reissued on Naïve 782120), Idil Biret (Naxos 8.553353) and newcomer Paavali Jumppanen (DG 000396402) are less vivacious. Biret seems utterly at sea. Regrettably, Tudor never recorded this sonata. Megadisc MDC 7845, with Goeyvaerts’ early serial compositions, is an essential collection. For the Barraqué sonata, Herbert Henck’s ECM 1621 is the best yet, though the awaited critical edition’s publication may stimulate fresh interest. Aloys Kontarsky serves up classic Stockhausen on Sony S2K 53346. In 1986, Robert Taub delivered the ultimate word on Babbitt’s piano oeuvre (Harmonia Mundi HMC 905160), exploring four decades worth of wit and expressiveness. For early-1950s Feldman, try mode 66 with pianist Philip Vandré, though, for the fanatic, Feldman and Tudor’s contrasting readings of Intermission 5 on Edition RZ 1010 are essential. 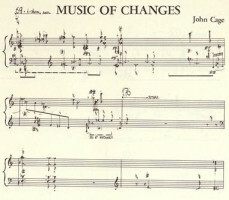 John CAGE: Music of Changes (1951). David Tudor (piano). hat[now]ART 133 (http://www.hathut.com/). Rec. Nov. 25, 1956. Despite the recording’s limitations, Music of Changes’ dedicatee performs with an aggressive vitality. Tudor had to have been reminded of Boulez’s Second and Artaud’s “Theatre of Violence.” Understandably, less resonance and aftereffects survive from WDR’s analogue tapes. 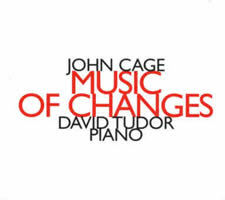 (hatART CD 6181 offers Tudor at Cage’s Music for Piano No 52–56 taped the same day.) Some notes are inaudible, e.g., the first A-B grace notes and the third measure’s descending triplets. I wonder whether Tudor’s score differs from what Peters published in 1961. In 1978, New World Records released an LP, NW 214, with Tudor’s 1953 taping of III and IV. Undoubtedly the best available recording (Tudor and Henck are O/P, Kubera and Schleiermacher fatally flawed), the aptly impetuous Joste follows Cage’s tempos, offering a front-row seat from which to share the risks. Chords punch, silences are pure. The pianist radiates the necessary heat. Mode’s recording ably captures the entirety, including the music’s interior sounds. Wisely programmed, balancing the studious and silly Cage, Joste permits other works at Music of Changes’ periphery. With their silences and nimble gestures, the Seven Haiku, none longer than 19 seconds, are like any Webernian splatter, though Cage will permit a Debussian flourish or a droplet of tonality. (Seven Haiku reused Music of Changes’ charts.) The closely recorded Suite for Toy Piano sparkles, a fitting chaser to Music of Changes’ density. 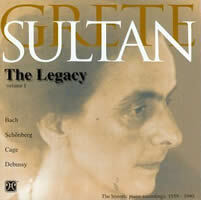 “Grete Sultan: The Legacy, Vol. I.” John CAGE: Music of Changes (1951): Book I only. Grete Sultan (piano). Labor Records LAB 7037 (http://www.laborrecords.com/). Rec. 1974. John CAGE: Music of Changes (1951). Herbert Henck (piano). Wergo 60099-50 (http://www.wergo.de/). Rec. Mar. / Apr. 1982. A surprising but appropriate sequencing, Labor precedes Music of Changes with Schoenberg’s Op. 33a. As I progresses — the only book offered — Sultan pays less and less heed to Cage’s tempos, isolating every gesture and chord with unnecessary air. It’s bizarre that someone so well acquainted with Cage (the 1974 Études Australes were written for her) would take such profoundly wrong liberties. Schoenberg’s Op. 23, Cage’s 1944 The Perilous Night, several Debussy Book II Études, and The Goldberg Variations complete this double-CD set. Pronounced attacks characterize Henck’s calisthenic I, yet II – IV disappoint. The unexpectedly pinched environment indicates a different recording session. Wergo caught delicate after-effects, pizzicato and knocking, but Henck’s high voltage in I doesn’t persist. Still working today, Henck understands this music’s context better than anyone else. ECM ought to rerecord him. “John Cage: Complete Piano Music Vol. 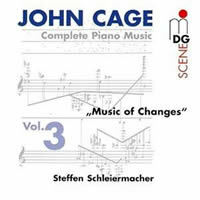 3.” John CAGE: Music of Changes (1951). Steffen Schleiermacher (piano). Musikproduktion Dabringhaus und Grimm MDG 613 0786-2 (http://www.mdg.de/). Rec. Oct. 24-27, 1997. John CAGE: Music of Changes (1951). 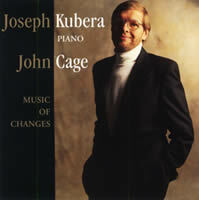 Joseph Kubera (piano). Lovely Music LCD 2053 (http://www.lovely.com/). Rec. 1998. Schleiermacher hews to a tempo almost 23% slower than Tudor and 25% slower than Joste, his intent being to shed light on denser passages. It’s a poor strategy. Though more frolicsome than others, his gambit yields no revelations. The remotely placed piano’s acoustic shines artificially. Overtones and sustained pitches are muddled. Kubera applies a strong dose of traditional musicality to newfound melodic traces, exposing some unintended dominant-tonic motion. A meek resonance matches the incorrect postmodern aesthetic. The four books slur together without pause.